Many of the clients I work with have recently moved into new homes. As a spouse of a former active duty military member, I know from experience how stressful (and tiring!) the process of moving can be! By the time we start thinking about hanging artwork on our walls, many of us have simply run out of decorating steam. 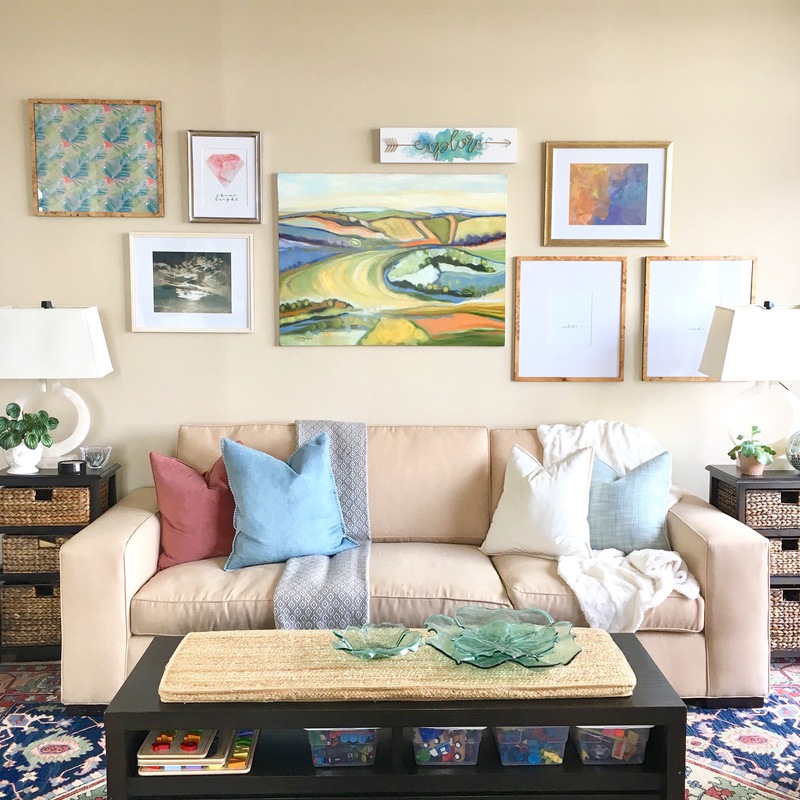 Yet, I hear it over and over again from clients, “Wow, our HOUSE didn’t quite feel like HOME until the artwork went up.” Artwork and photography personalize our living spaces. They offer a reflection of who we are and they bring warmth and coziness to any room. This couple had recently moved into a charming house in Silver Spring, MD and had just welcomed a precious new baby into their family. After unpacking endless boxes and arranging the furniture, the couple realized they needed professional help figuring out where to place their existing artwork. First, I always ask clients to lay out all the pieces that they are considering for display. It helps me get a sense of the big picture and to see which pieces are working well together. The client also explained which walls should be a priority: in this case, we focused on the family room walls as this space is where they welcome guests into their home and is the main entertaining area. The large wall over their couch was the perfect spot to design and hang a gallery wall. I arranged the client’s own artwork, pieces that they had collected while traveling. I kept the look cohesive by choosing pieces with warm earthy tones and similar framing. I also wanted to incorporate this amazing teardrop shaped mirror from Crate and Barrel that the client had recently purchased. On a second visit to the client’s home, I helped with the upstairs rooms. I hung two pieces in the master bedroom, as well as the artwork in the nursery, including this amazing personalized round wood sign from Etsy seller MySignatureTimber. Check them out because all of their signs are adorable!! Are you ready to get your artwork up off the floors and back on your walls?